Maybe it is because sunshine makes me think of tacos, but I have fiestas on the brain. I really think it is just the pretty summer sets coming out everywhere that are making me think of bright pops of color hanging from string. 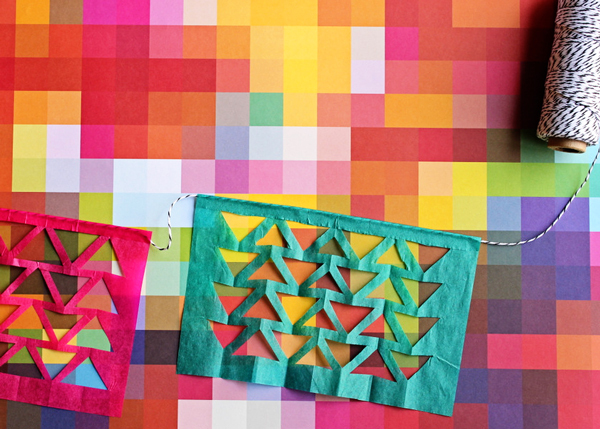 Fun patterns of easy to cut shapes gives a update to the traditional fiesta bunting. What fun! All the instructions and more photos after the jump. You will need: tissue paper, scissors, twine and double-stick tape. 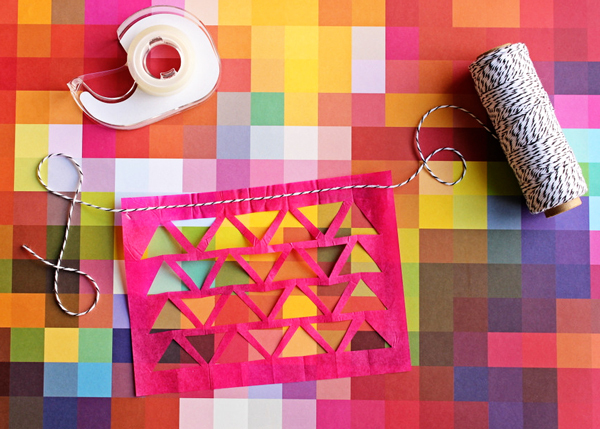 Add a cutting pad, a ruler and a rotary cutter to make it super easy. First, cut 5 x 7 inch rectangular pieces of tissue in various shades. Next, we will fold it accordion style. Start with one sheet to practice the technique, then later you can layer about 4 or 5 to make a bunch at the same time. Fold sheet in half. Starting on the folded edge, fold a 1/2 inch section. Then fold back another 1/2 inch. Repeat once more for 4 times total including when you folded in half. You should have a little bit of edge left over. Leave it plain and do not fold it. Starting 3/4 of an inch down, cut a straight line from the folded edges. Do not go all the way over and stop about 1/8 of an inch away from opposite side. Cut at an angle, cutting out a triangle as shown. Repeat with another straight edge about 1/8 of an inch down. Finish cutting out the triangle. Repeat twice more. Open so the “extra” edge is folded out. Now repeat cutting out triangles on the opposite side. Be careful not to go all the way through to the first row of triangles. 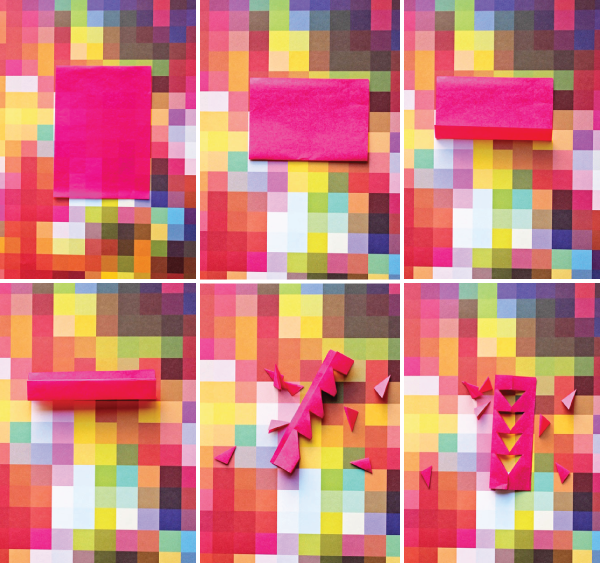 Once you are done, unfold and repeat with remaining pieces. You can flatten these with your fingers or lightly iron sheets between paper towels on a low setting. All the wrinkles will not come out, but it helps to press them flat. To tape as a garland, you will first run a line of double-stick tape across the top of a single flag. Then press the twine into the tape. Fold over the edge and continue to add flags to suit the length you need. These were super easy, and since I can get them in any shade under the sun, I’m thinking the next version will be ombre. Hang, serve with ice cream floats and cupcakes and viva fiesta! that pixel paper is rad! like cut out snowflakes for the summertime! i love this and am ready for a fiesta! Love this! I will definitely be making it in the future. Love this Idea! Also love the color square background. Is it fabric or paper? So simple, yet so pretty and fun! I LOVE these. They bring so much color to your party! Thanks for sharing. I love your black table cloth with the plus signs! Did you make it? If you didn’t where did you find it? Oh, I love this! Super fun! (Fridha Kahlo + gold theme) on june. I love your work, I found your blog through NieNie! Pleassssssssssse share where you got that pixel paper or fabric. It’s amazing! Great idea. I love the colours you used. That pixel background is awesome! I will DEFINITELY be making these for our shindig, these are so cute!! This looks so cool – wish I was organised enough to actually do things like this before my parties! LOVE IT! Can I decorate my apartment like this all year long? oh, I love your blog. Thank you for inspirations! This is perfect for a warm summer picnic. Super cute for adults and kids! I have that same sheet of paper (used for background). Love Paper Source. Hi I love this site … I Have told my frinds about it and they love it as well.. This idea woud have to be the best ! so simple but so effective..
Love it! but where did you get that pixel paper or fabric. It’s fantastic!! 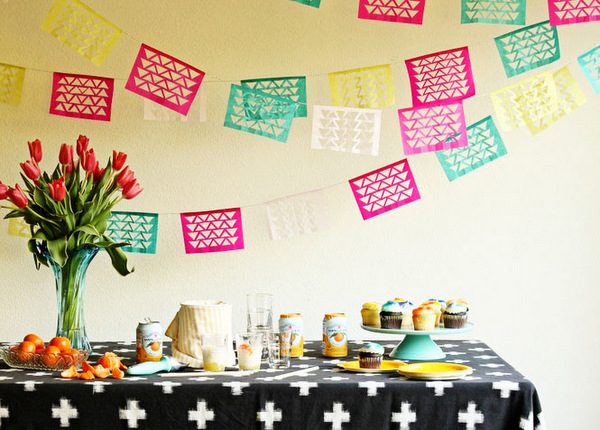 Ohh… this makes me want to have a Cinco De Mayo party, JUST so I have an excuse to make these. Very cute. oh my word! You really do make me happy. You have the best projects, i just finished doing the confetti tablecloth the other day and will def be starting this project today…. THANK YOU!! Love love love this. And I’m pretty obsessed with that pixel paper! Awesome post. If something it’s simple then it’s even nicer! wonder if you could use a punch to do those shapes? your thoughts…. Beautiful pixel background – can you please share what/where/how i can get this too?! Thanks! Those garlands are so fun! I could definitely see myself making them for a fun and colorful party. 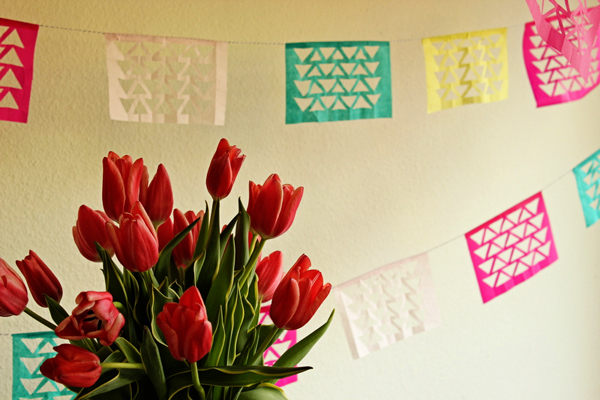 Wow, homemade papel picado! Love it! Happy Cinco de Mayo, everyone. Wow! 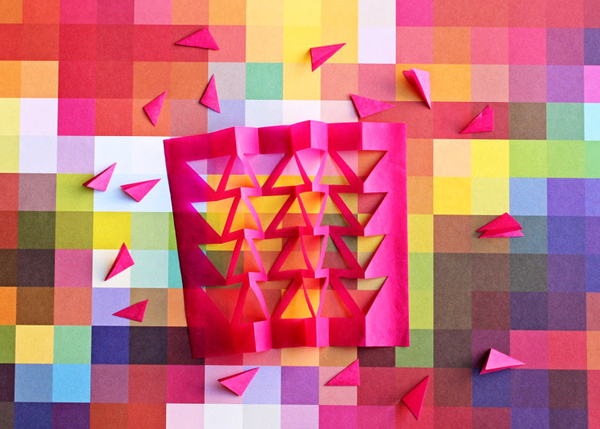 that colorful block paper background is awesome! Fun tutorial too. I love hanging banners. I love it! That paper is rad, and so it your cross tablecloth. 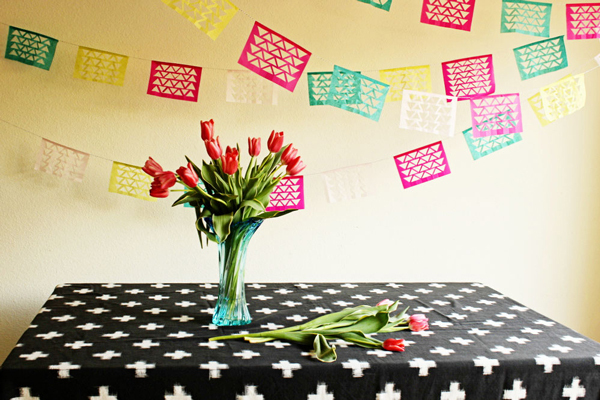 Gearing up for a cinco de mayo post and came across your great updated garland. Love! Thank you for inspirations ! I wonder if I can decorate my apartment like this all year long ? Love it ! 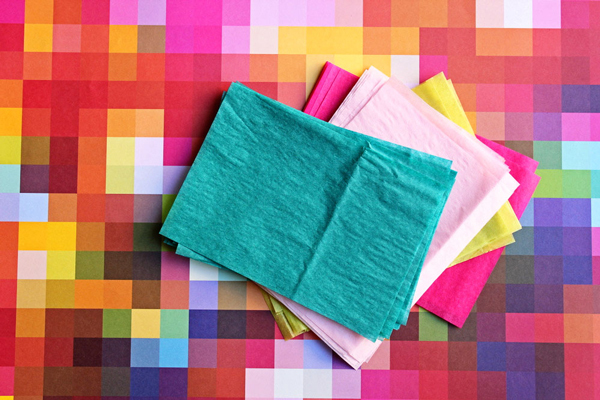 but where did you get that pixel paper or fabric ? It’s so fantastic! !